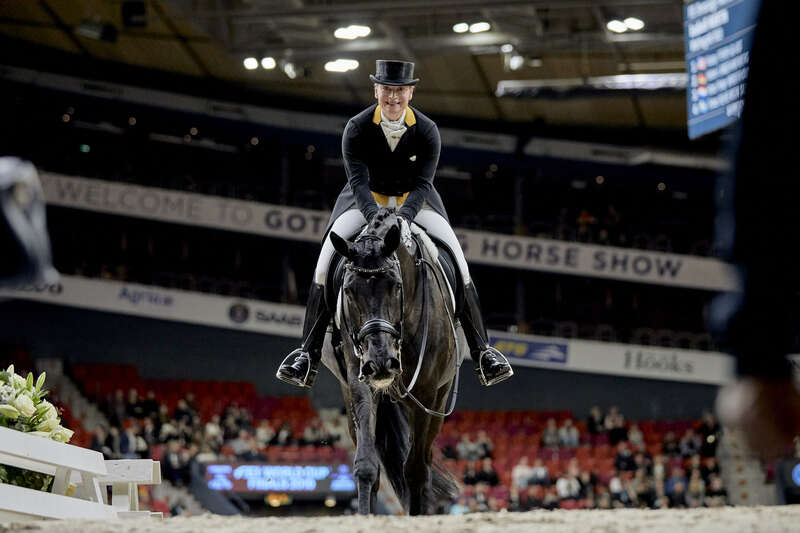 The legend that is Germany’s Isabell Werth (49) steered her wonderful 13-year-old mare, Weihegold OLD, to victory in the Grand Prix as the FEI Dressage World Cup™ Final 2019 got underway at the Scandinavium Arena in Gothenburg (SWE) this afternoon. she admitted, after the World No. 2 combination of America’s Laura Graves (31) and Verdades slotted into second place on a day when US riders were highly impressive. Indeed tomorrow’s deciding Freestyle competition looks set to be another thriller, and the sold-out stadium will be throbbing with excitement. Third-placed Dane, Daniel Bachmann Andersen, said it suited his stallion Blue Hors Zack when the crowd clapped enthusiastically as they came into the ring. But Judy Reynolds’ Vancouver K didn’t feel the same way, spinning around with fright and boiling over at times when they were first to go. The Irishwoman, whose Freestyle programme is a big crowd favourite, just shrugged it off after finishing 14th of today’s 18 starters however. That blip is already confined to history as far as she is concerned.